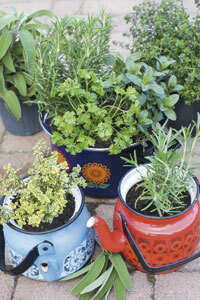 Fresh herbs give a great lift to many foods – so grow your own in pots sited near the kitchen for ease of picking. And why not choose some colourful, fun containers to plant in? Sow seeds in March, or buy small herb plants in April or May, pot up at once and start picking leaves as soon as the plants have grown slightly. Plant in a sunny position. The job will take about an hour. Seed packets or small plants of parsley, thyme, marjoram (oregano), sage, mint and rosemary. Six small plastic pots for potting up seedlings bought at the garden centre. Seed tray, modular cell system or jiffy pots for sowing seeds, if using. Five containers such as the enamel kettles. Soil-based potting compost and proprietary seed compost if using. 1 Fill the seed tray or modular cell system with seed compost and sow your seeds according to the instructions on the packets, or sow in jiffy pots according to the manufacturer’s instructions. Keep on a kitchen windowsill while the seeds germinate, then move them outside when all danger of frost is past. 2 When the seedlings are large enough to handle, pot them on into the plastic pots using potting compost and lining with broken crocks for drainage. 3 Or, line the plastic pots with broken crocks and fill with potting compost, into which you have mixed some sharp sand (if using). Then plant your garden centre seedlings, place into the containers and set out in an attractive arrangement. In general, allow one herb per container, but if the container is big enough, put several in together – here rosemary, parsley and mint have been put in the central container. 4 Place the young herb plants outside only when all danger of frost is past. If you’re uncertain, place them outside on sunny days and bring them in at night until the weather warms up enough for them to be left outside permanently. 5 Pick and use the leaves regularly. All these herbs can grow quite large and, by the end of summer, may well have outgrown their containers unless you keep them under control. Most herbs do best in full sun. They don’t require rich soil, but they must not be allowed to get waterlogged, so good drainage is essential. Rosemary, sage, thyme and marjoram are tough, shrubby plants and can be kept going for years if put into the ground or grown in large enough pots. Mint and parsley are herbaceous and will die down in winter, but reappear again in spring. Regular picking is needed, and watering with care. The way you’ve potted the herbs up is darling. I have a red basket that I’m saving for some of my herbs this year. But it’s a bit too chilly yet for them to go out here. It’s funny, but growing herbs last year is what’s launched me into undertaking a full-fledged container veggetable garden this year. Having the small cluster of rosemary, thyme, and basil was so satisfying to me that I wanted more. What fun. Thanks for sharing your cute container ideas. Now, I need to go prowl some “junk” shops for nifty pots!